In October 2013, 14,000 graduate students, spread across all the disciplines of science, applied for the National Science Foundation Fellowship. "It's very prestigious in the science world," said Kendra Souther, ‘13. "It's a really big deal." She would know. She was one of the people who received it. In April 2014, while she was finishing up her first year as a Ph.D. student in chemistry at the University of Michigan, Souther received the award. But the grant didn't just show up in her email inbox one day (or, in Souther's case, her Spam folder). She had to work for it. Or rather, she had to write for it. At CSS, Souther earned degrees in not one, but two STEM fields — chemistry and math — enough to intimidate even the brightest students. But Souther had a lot of help. "The faculty was so supportive. My professors helped me decide what classes to take, pushed me to double major, allowed me to perform research with them and ultimately advised me on grad school," Souther said. "They were key to my success." But as Souther moved on to this next step, she soon realized that knowing science isn't all there is to being a scientist. "We actually have to write a lot," she said. "We have to write grant proposals to get funding for our research, articles for publications and essays for awards like this." Which is why she's thankful for the liberal arts experience she had at CSS. Classes in subjects like communication and English helped hone her writing and critical thinking skills and prepared for this often overlooked aspect of science. So, too, did her time as a McNair Scholar — a program that provides underrepresented minority, first-generation and low-income students with the research opportunities, workshops, application help and mentorships they need to prepare them for success in graduate school. "I think being a McNair Scholar was part of the reason that I got this award," Souther said. "Because of that experience, I knew how to tell my story and discuss how my work can make an impact in the scientific community." Soon this impact will be noticed. 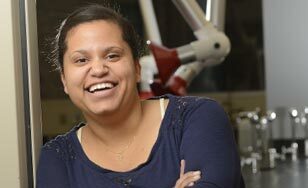 Thanks to the fellowship's financial award that covered her tuition plus a stipend, Souther has been able to devote about 70 hours a week to her research. For it, she's focused on polymers for organic electronics — the things that make solar power and other forms of renewable energy work — an area with huge practical implications. "I think it's the future of research," Souther said. And in August she will present this research at the American Chemical Society national meeting, with the hopes of her results being published in a major American chemical journal sometime around then. But as important as her research is, there's something pulling in another direction. "After graduate school, I'd like to teach at a liberal arts school like CSS," Souther said.